The Pacific Theater was the largest theater of World War II. Because of its watery expanse, Army avi­a­tion engi­neers and Sea­bees had to build more than 100 air­fields on islands that dotted the Pacific, from New Guinea in the south, up through Guam, the Mari­anas, Iwo Jima, to Oki­nawa. On this date in 1944 on Sai­pan in the Mari­anas, an is­land chain seized from the Japa­nese only that summer, XXI Bomber Com­mand wel­comed its first long-range, heavy-bomber B‑29 Super­for­tress, though no bomber fields were yet fully opera­tional. Later in the month photo­recon­nais­sance versions of the B‑29 began arriving on the island. On Octo­ber 27 eighteen bombers launched a warm-up mis­sion to a Japa­nese sub­marine base on Truk Atoll, 600 miles away. The first 15‑hour, 3,000‑mile round­trip to the Japa­nese capital, Tokyo, occurred on Novem­ber 7—a B‑29 (F‑13) recon­nais­sance intruder at 32,000 feet, the first American air­craft over Tokyo since the Doo­little Raid thirty-one months before. On Novem­ber 24 XXI Bomber Com­mand, led by Maj. Gen. Curtis LeMay, sent the real thing: 111 B‑29s from Guam, which tar­geted an air­craft fac­tory, port facili­ties, and urban-indus­trial areas. Damage was minor but the primary B‑29 mis­sion had begun: destroy Japan’s indus­trial capa­city to con­tinue the war. Only later, following a large-scale test of an in­cen­diary bombing raid on Tokyo on Febru­ary 25, 1945, did the mission shift to de­stroying Japa­nese popu­la­tion centers. By war’s end, 50 per­cent of Tokyo’s urban area had been de­stroyed by fire and over three mil­lion resi­dents were home­less. Other cities suffered to a greater degree: Toyama, a center for alumi­num, ball-bearing, and special steel pro­duc­tion, was 99.5 per­cent destroyed on the night of August 1–2, 1945, when 173 B‑29s dropped in­cen­diary bombs on the city; Kofu, was 77 per­cent de­stroyed; Hitachi, 72 per­cent; Oka­yama, Nara, and Tsu, 69 per­cent; Shizuoka, 66 per­cent; Kago­shima, 63 per­cent; Yoko­hama, 58 per­cent; and Kobe, 55 per­cent. The attack on these and 57 other major Japa­nese cities caused as many as a half-million deaths, while dis­placing as many as five mil­lion people. LeMay’s air force dropped mil­lions of leaf­lets over Japan warning its citizens “in accor­dance with Amer­ica’s humani­tarian policies” to evacuate their homes and businesses and save their lives. 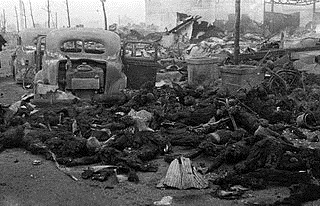 Left: Charred remains of Japanese civilians after the March 9–10, 1945, fire­bombing of Tokyo (Opera­tion Meeting­house). Around 1,700 tons of bombs were dropped by 279 B‑29s and roughly 16 sq. miles of the city were destroyed. The U.S. Stra­te­gic Bombing Survey esti­mated that nearly 88,000 people died in this one air raid and resulting fire­storm, 41,000 were injured, and over a mil­lion resi­dents lost their homes. Another esti­mate is that the Japa­nese capi­tal suffered more imme­di­ate deaths than either Hiro­shima or Naga­saki, which were targets of atomic bombings in August 1945. Left: Boeing built 3,970 of these four-engine, pro­pel­ler-driven B‑29 behe­moths between 1943 and 1946. 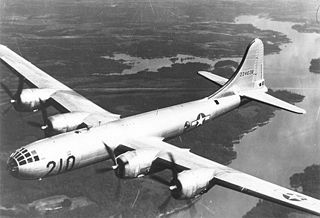 B‑29s carried out the atomic bombings that destroyed Hiroshima and Nagasaki in August 1945. 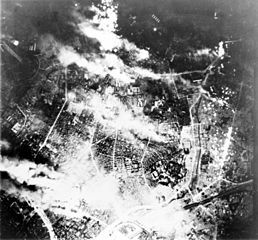 Right: Tokyo burns under a B‑29 firebomb assault, May 26, 1945. 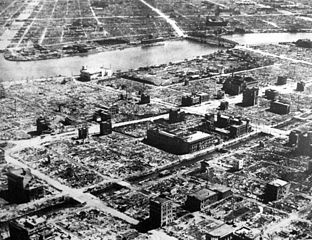 B‑29 raids on Tokyo began on Novem­ber 17, 1944, and lasted until August 15, 1945, the day Japan capitu­lated. Inter­estingly, in the six days between dropping the second atten­tion-grabbing atomic bomb on August 9—this on Naga­saki—and the day of Japan’s capitu­la­tion, August 15, B‑29s carried out an addi­tional 1,000 indi­vid­ual sorties.